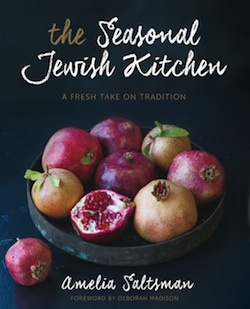 Amelia Saltsman’s background makes for an interesting source for her cookbook The Seasonal Jewish Kitchen (Sterling Epicure, 2015). Her mother is Romanian and her father is Iraqi; they met in the Israeli army and then immigrated to Los Angeles, where Saltsman was born and grew up. She and her family live in Santa Monica. 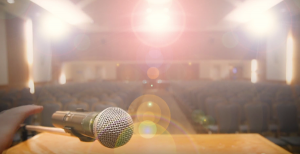 Saltsman is a regular contributor on food in the media. One day, while cooking and sharing her ideas on various social media and her blog, the responses were so overwhelming, she realized “that a new generation of cooks was looking for a fresh approach to Jewish food.” Thinking about her heritage led her to explore her family’s culinary roots more deeply. When she divided the year into two-month microseasons, she saw how foods meshed with the holidays occurring during those times. The result is 146 recipes plus 135 beautiful, enticing color photographs. Within each two-month section is the description of a holiday, the background image for which is a piece of Arab embroidery. And each two-month section contains recipes connected to the holiday, from starters, salads and soups, to side dishes, main courses and desserts. There are essays on what comprises Jewish food, as well as explanations for how to use the cookbook, ingredient essentials, kitchen fundamentals, helpful kitchen tools and seven basic recipes. There are two special indexes – recipes by course and by kosher category – a bibliography, information on the holidays, a resource guide, acknowledgments, more about the author and a regular index. Weights are given in imperial and metric measures. One of my favorite aspects of a cookbook is anecdotes on each recipe, which Saltsman includes, and which make for a very warm and personal read. One of my other favorite features is numbering of instructions, which is not used in this cookbook. Recipes are from Tunisia, Morocco, Germany, Syria, Yemen, Persia, Bulgaria, Hungary, Eastern Europe and, of course, Romania and Israel. Some of the recipes I found particularly interesting include autumn slaw with beets, carrots and kohlrabi; Syrian lemon chicken fricasse; braised beef with semolina dumplings; apples in nightgowns; rustic almond-orange macaroons; rice with almonds and raisins; bulgarian cheese puffs; and whole fish with preserved lemons and herbs. For Chanukah, here are two of her recipes. Using the large holes of a box grater or a food processor fitted with the grating disk, grate the potatoes (about five cups). Grate the onion on the large holes of the box grater or use a food processor. In a large bowl, stir together potatoes, onion, flour, salt, baking powder and a few grinds of pepper. Stir in eggs. Line two or three sheet pans with paper towels. Place the prepared pans, the latke batter, a large spoon and a spatula near the stove. Heat one or two large skillets over medium heat. Do not use more than 1/4-inch oil. When the oil is shimmering and a tiny bit of batter sizzles on contact, start spooning in the latke batter, making sure to add both solid and liquids Using the back of the spoon, flatten each spoonful into a circle three to four inches in diameter. Do not crowd the latkes in the pan. You will get four or five latkes in a 12-inch skillet. Cook the latkes, flipping them once until golden on both sides, five to six minutes total. Transfer the latkes to the prepared baking sheet. Cook the remaining batter in the same way, stirring the batter before adding more to the pan and adding oil as needed at the edge of the pan. Arrange the latkes on a warmed platter, sprinkle with sea salt, and serve with applesauce or sour cream. Halve the pears and apples through the stem end, then core them and place the halves, cut side down, on one or more sheet pans, spacing them one to two inches apart. If using the thyme, scatter it among the pears and apples. Cover the pan tightly with aluminum foil. Bake the apples and pears until tender when pierced with a knife tip (30 to 40 minutes). When they are cool enough to handle, slip the fruits from the skins and back into the pan, scraping any pulp from the skins. Discard skins and thyme stems. Mash the apples and pears with a fork, stirring in enough water or other liquid to help scrape up any brown bits from the pan bottom and lighten the texture of the fruit. Scrape the mixture into a bowl and serve warm, at room temperature or cover and refrigerate up to a day ahead and serve cold. This can also be made with all pears or all apples. Sybil Kaplan is a journalist, foreign correspondent, lecturer, food writer and book reviewer who lives in Jerusalem. She also does the restaurant features for janglo.net and leads weekly walks in English in Jerusalem’s market. Next Next post: How about a meowukiyah?